Toll-like receptors (TLRs) are pattern recognition receptors (PRRs) which play a crucial in the initiation of innate immune response by detecting potential harmful pathogens. In mammals, the number of TLRs varies between species: human have 10 TLRs whereas mouse have 12 TLRs. They are specialised in the recognition of conserved molecular structures in bacteria, viruses, fungi and parasites. Each TLR has a broad range of specificities (Figure 1). TLRs are type I transmembrane receptors composed of an extracellular domain involved in the recognition of the microbial product, and a TIR domain in the cytoplasmic tail that recruits different signalling molecules that will in turn activate the transcription of genes involved in inflammation and in anti-microbial defences. Each TLR tailors the immune response to the pathogen that they sense. 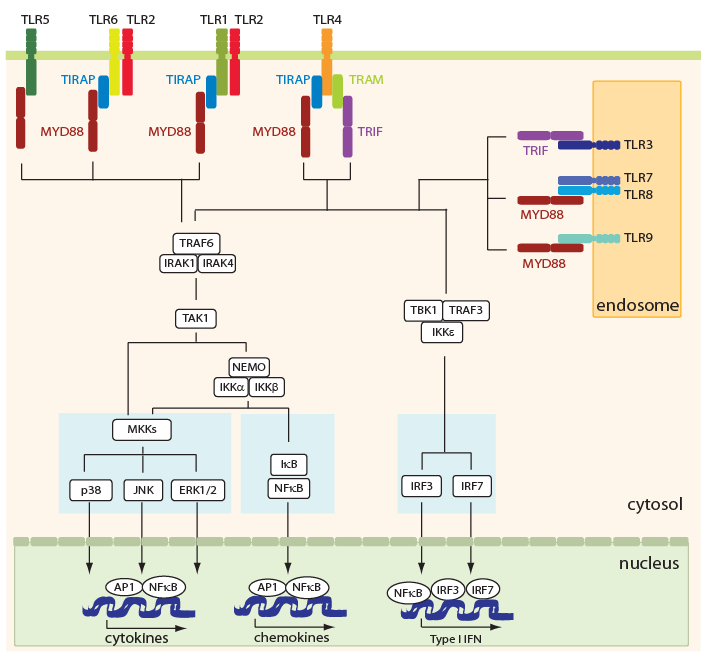 TLR signalling initiates with the recruitment of adaptors proteins to their cytoplasmic tail. There are two main adaptors: MYD88 and TRIF. In addition, TLR1, 2, 4 and 6 need a second adaptor called TIRAP to recruit MYD88 and TLR4 needs TRAM to recruit TRIF. These adaptors recruit several proteins, such as kinases, which initiate different signalling cascades. TLR-mediated signalling pathways lead to the translocation of transcription factors, such as NFkB and IRFs in the nucleus, where they activate the transcription of several genes involved in the immune response which eventually result in the elimination of the pathogen. These cytokines shape the T-cell response. TLR signalling is also important for enhancing antigen uptake and presentation. Despite the different TLRs having several signalling pathways in common they are nonetheless able to tune the quality, the intensity and the duration of each of these signalling cascades to generate an immune response specific for the pathogen they are sensing.